Ripe bananas are versatile and delicious fruits. They make sumptuous desserts both hot and cold. With that said, Springtime Cottage offers you yet another awesome way to make good use of your bananas! We proudly present the quick delicious banana fritters! Do enjoy! Making banana fritters is an easy way to make use of the well ripened bananas before they go bad instead of dumping them in the freezer or throwing them out if you are out of freezer space. If you have children this banana fritters recipe is an awesome way to win their hearts, as kids love these banana fritters. 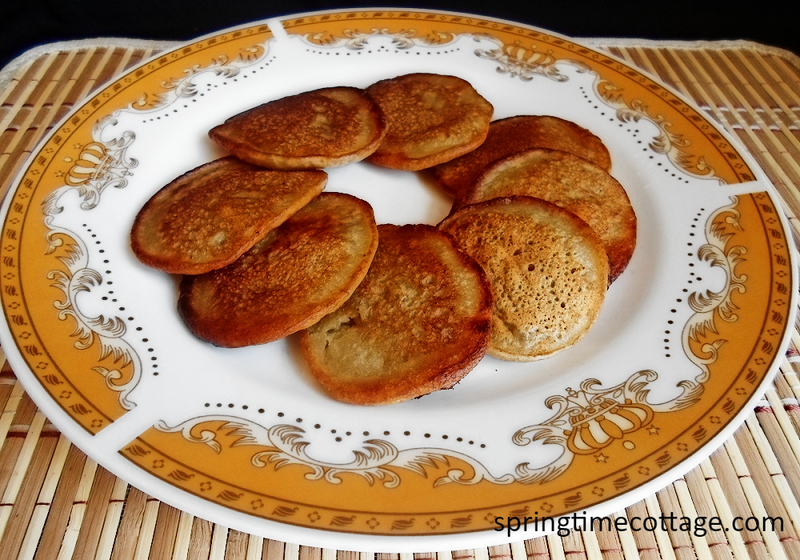 If you are working on a budget or love to plan frugal meals, this banana fritters recipe is superb for you. You may include it as breakfast, brunch or lunch. To prove how much banana fritters are loved by kids, visit the beautiful island of Jamaica and you will see banana fritters being sold to children at schools, roadside shops, cookshops and restaurants all over the island. A lot of side hustles are created with banana fritters in Jamaica. Banana fritters are well worth knowing. The time and effort to make such an awesome treat is minimal and the level of satisfaction banana fritters give is tremendous. Banana fritters can keep you full for long periods of time hence helping you to keep a little more cash in your purse. Note: Banana fritters can be prepared by either mashing the bananas with a fork or blending them to a very smooth thick consistency using very little water in a blender. 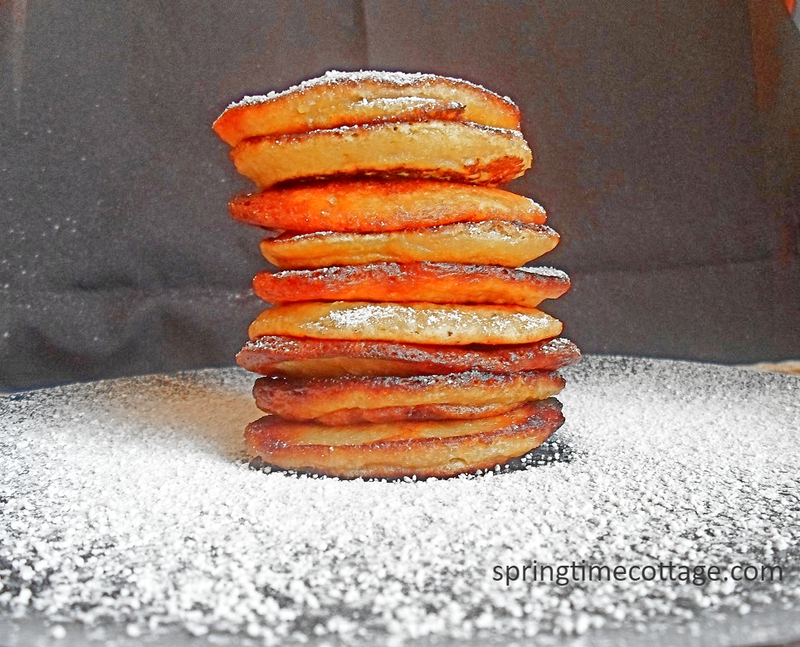 This banana fritters recipe is done with the blending method. Observation: There are many banana fritter recipes on the internet, some of which give slight variations to the original recipe. We will not say any is right or wrong, they are just different. 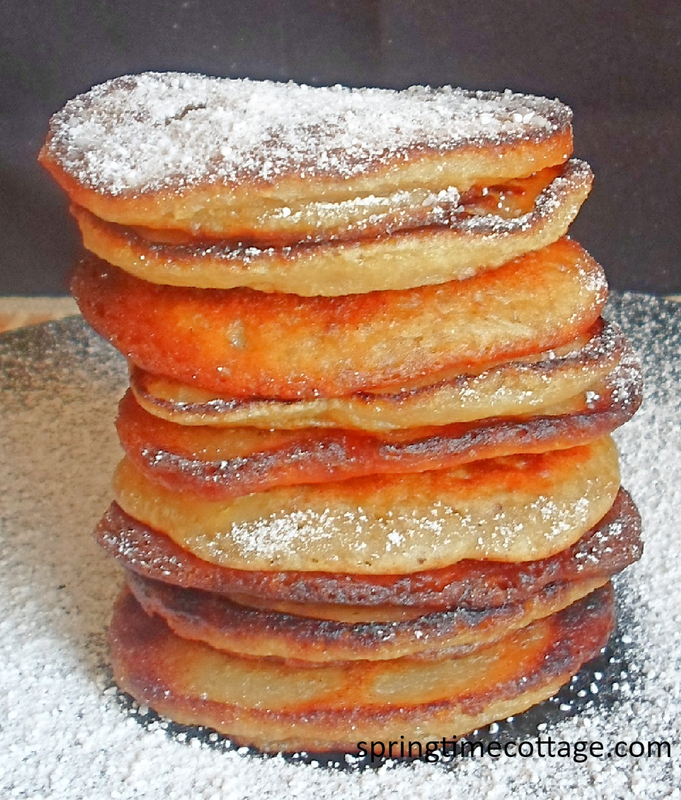 You are to note that original banana fritters are not made with eggs, butter or margarine added to the recipe. Deep frying banana fritters may not be the best idea if you want to consume minimal grease at a time. Pro Note: The reason for not using the deep frying method is that banana fritters are prepared as a sweet dough. As a result it has to be fried on low flames to prevent burning. In the case of deep frying, the low flames will cause the batter to be oil soaked or absorb more oil than normal before it is completed. 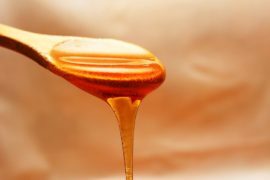 Small Spills: This is when a small amount of batter escape from the spoon before or after the intended scoop of batter is lowered in the oil. as a result some of those particles will burn in the oil while you cook. We want you to prevent that from happening so we will demonstrate below. Step 1: Combine the banana with water or milk and vanilla in a blender and blend for 15 to 30 seconds ensuring that the banana is smothe. 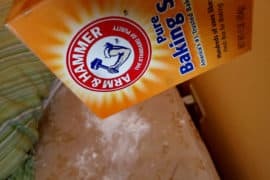 Step 2: Combine all dry ingredients- flour, sugar, baking soda or powder (not both), salt, cinnamon and nutmeg in a bowl. Mix until all the dry ingredients are evenly combined. Step 3: Light stove and lower the flames to medium heat. Place a 10 inch skillet/ frying pan on the stove. 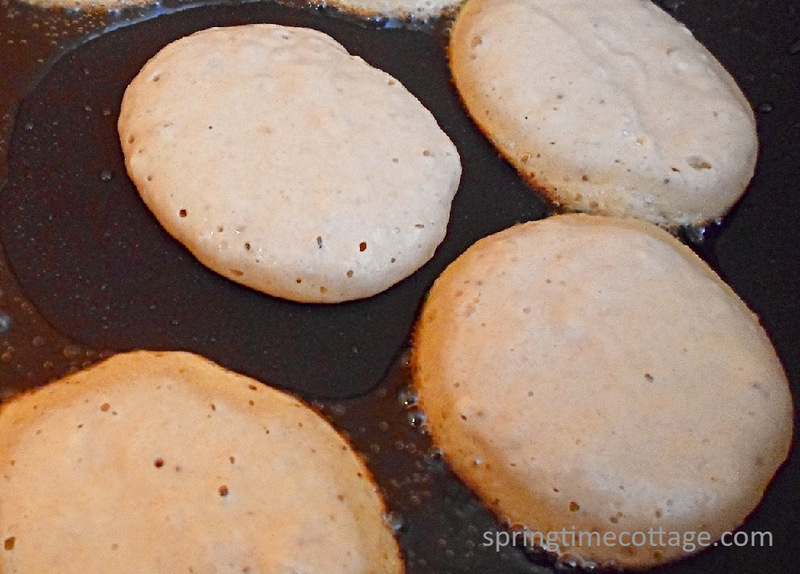 Pour in one tablespoon of the vegetable oil at a time as per each batch to be fried. This will ensure that the banana fritters soak up minimum amounts of oil at a time. They should have a slight resemblance of pancake when being fried. Let the oil heat for at least 2 minutes while you attack the next step. Step 4: Combine the banana mixture with the dry ingredients using a spoon to mix until no lumps are present and the batter is of a thick but slightly runny consistency. This banana fritter recipe batter resembles pancake batter. Step 5: Use a tablespoon to scoop out each fritter rubbing the spoon against the side of the bowl to prevent excess dripping. Put the spoon as close to the hot oil in the frying pan as possible before slowly emptying the batter in the oil. This will prevent the oil from splashing (safety is key). You also want to prevent any small splashes or spills of dough in the oil. The dough is ready to turn when the top starts forming bubbles – and by this time the bottom is perfectly cooked and should be golden brown. Turn over with a spatula and each fritter should be a fully cooked after one minute of turning them or until both sides are golden brown. Carefully remove the fritters from the hot oil by letting excess oil drain from each while lifting them out. It is best to take the plate or pan close to the frying pan when removing the fritters so you will not have any oil spill to clean up. Let the fritters drain on some paper towel. Serve hot or room temperature. Dusting with confectioners sugar is by no means necessary. We only do it for photo fluff. Taste great with cold passion fruit juice! Try this banana fritters recipe and let us know how it turns out.